Lately I've been thinking about technology and the impact it has around the world and in our personal lives. Actually, it's the buttons on the remote control as my housemates and I watched TV that started it all. Suddenly the buttons had a larger dimension and meaning. Think about it: POWER, PLAY, PAUSE, REWIND, FAST FORWARD, STOP. Here before me was a perfect description of our spiritual life! Each day, rising from sleep, we push the POWER button. We are awake because "In God we live and move and have our being" (Acts 17:28). We are awake because of the breath of life given to us by God, who gives us another day to become all that God desires for us. And we begin to PLAY out our day, making connections with the world around us to fulfill God's dream for us and for the world. It wouldn't hurt if we really did take some time to PLAY in this world, recognizing that the world around us holds amazing surprises and miracles. It's a good thing to PAUSE during the day. Get up and look out the window to get a bigger view of life. Take five for a cup of tea and count your many blessings. For one minute, simply breathe in peace and breathe out tension; breathe in trust and breathe out fear. The PAUSE gives us a small moment to REWIND our being human in the world, before we FAST FORWARD to the completion of the day. Ah, before we lay our heads on the pillow at night, we STOP and recall what this day has held for us. We call it the "Examination of Consciousness." Here are the easy steps. Place yourself in the presence of God. Look at your day with gratitude. Ask for the help of the Holy Spirit to look over your day, not to find fault with yourself but to gain wisdom and understanding of your own gifts and limitations. How did I find God today and how did God find me? How did I gain freedom to cooperate with God's desire for me? End with your favorite prayer, confident that tomorrow you will be ready to push the POWER button with inner peace and inner freedom. From February 10-13, I was part of an "Eat, Pray, Mush" retreat with eight College of Saint Benedict alumnae/staffa nd two other Benedictine Sisters. We gathered in the pristine Boundary Waters area near Ely, Minn., where the Wintergreen Lodge guides quickly took us through the "Dos and Don'ts of Dog Sledding." Each day began around 7:30 a.m. when we were enthusiastically greeted by 30 dogs howling for their breakfast. To my surprise, being acknowledged and affirmed was as important as being fed and watered. Harnessing and selecting a team of five dogs for each two-person sled wasn't simple. Dogs were placed next to dogs with whom they were compatible. Some dogs had to be "top dogs" while others pulled conscientiously without drawing attention to themselves. Some barked as though pleading, "Pick me!" Others got depressed if they weren't chosen. All appreciated being affirmed and thanked. At the signal, "Hike, Hike!" the dogs took off with the enthusiasm of race horses out of the starting gate! Whenever they found their rhythm, pulling the sled across expansive fields of snow and frozen lakes felt effortless. They were completely focu sed, on task and enjoying it! Pulling up steep hills required assistance-- we pumped, or got off the sled to make the climb easier. The dogs could be distracted by something on the trail, the scent of another animal, the need to "eat snow" or mark the territory. No matter how tired they were at the end of the day, the prospect of home revived them and they picked up speed. It didn't take me long to realize they weren't simply dogs-- they were Curly, Heinzy, Steve, Sparky, Sheila, Elwood, Jupitor, Orion, Matilda, to name a few. Very quickly, bonding with the dogs as we traveled through the stunning winter beauty of Minnesota's forests turned our gathering of 11 women into a community. Thank God for dogs! photos: (top) Patches (right) with a friend relaxing after the run. (bottom) Sheila getting a belly rub by Teri Carlisano, with Curly and Heinzy in the background. Next weekend, we elect a new prioress for Saint Benedict’s Monastery. We follow a process called “discernment,” a special mode of listening to God, self, others and history/life experience. It isn’t easy to describe, but here is a sneak peek. For months before this event, we prayerfully ponder and then publicly discuss in detail what we deeply care about as our monastic community moves into the future. This happens at our regular Chapter meetings attended by approximately 200 Sisters, with other Sisters Skyping their comments and/or praying for the wisdom of the Holy Spirit. Within the Chapter meetings, we watch our treasured Benedictine way of life come into focus and see both unique internal movements and emerging outreach potential revealed. Based on that information, we identify qualities that individual candidates possess which might lead us into our dreams for the future. TAUGHT by each speaker, because we are all equals. All Sisters present at the Election Chapter, February 25-27(28) will cast their votes after having heard each candidate describe her leadership strengths as well as her personal challenges. 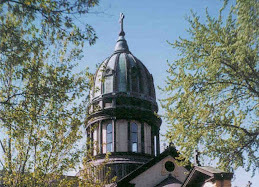 The Sister receiving a 2/3 majority will be installed as the new Prioress on Sunday, June 5, 2011. Thank you for joining your “listening heart” prayers to ours during this time. 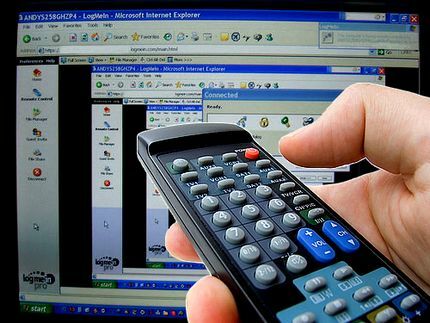 Some time ago I was very impressed by a PowerPoint presentation that someone sent me on the Internet. 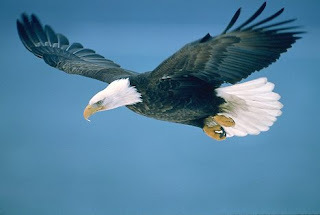 It told the story of the bald eagle who, in midlife, at a time when his beak and talons are overgrown (at about 40 years of age), flies to a high peak and smashes his beak on a rock until it falls off. The eagle then waits for the beak to grow back. When it does, the eagle can resume taking care of his talons and cleaning himself. What I have discovered is that the story is a myth or legend meant to teach us about choosing life. Another example of someone choosing life is the story of Aron Ralston who some years ago now while canyoneering found himself in a very narrow passage and his arm became pinned between two boulders when one of the boulders shifted. He was unable to call for help and so spent several days drinking what little water he had and hoping against hope almost that he would be rescued. After five days with his arm still pinned down, he realized that his hand was dying -- the skin was beginning to fall off. He began planning how he could break and then cut off his arm and thereby save his life. His story was featured on Dateline a couple of weeks ago and is the subject of the movie 127 Hours. Aron did make it out after cutting off his own arm. He said he felt elation (despite great pain) that he doesn't think he will feel again once he was freed from the rock. Both stories, the legend of the eagle and Aron Ralston's dramatic gesture of removing his own arm, epitomize for me the sometimes difficult decisions we are called to make in life. Most of the time they are not as life threatening as Aron's was, but they can call for enormous courage all the same. This past weekend we heard these words from Deuteronomy at Evening Prayer: ". . . I have set before you life and death, blessings and curses. Choose life so that you . . . may live." (Deut. 30:19). When was there a time that you chose life? What was that like? Every year, on the Feast of St. Scholastica, we read a charming story at Morning Prayer about the last visit on earth that saintly twins Benedict and Scholastica experienced. 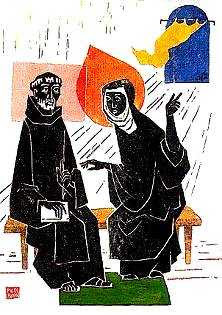 The story from The Dialogues of St. Gregory tells of Scholastica's yearly visit to her brother's monastery. He arrives with his companions to the gate, and the delightful visit takes place, with the siblings catching up on their separate but similar lives. When the time comes for him to return up the mountain, Scholastica begs him to stay the night so they can continue their holy talk. He, however, reprimands her, telling her to remember that he must return to his monastery. asking God in prayer to answer her request. Immediately upon her prayer, the sky opens up and rain pours in torrents. Benedict reprimands his sister but she simply replies that since he would not grant her wish, she prayed to God for help. No one was able to leave and they spent the night talking about spiritual matters. In the morning, they return to their respective monasteries, but Gregory explains that this one time Benedict did not have his way, showing who had the greater love. Three days later Benedict sees his sister's soul, in the form of a dove, flying up to heaven. I have been attending a "hard bodies" exercise class on Monday mornings at Gold’s Gym for the last four years. Sometimes I am a little hit and miss, depending on my schedule. The other women in the class, young mothers in their 30s, did not quite know what to think of having a Sister in the class. They warmed up to me as we all struggled through core exercises. Together, we groaned, had sore muscles and wondered why we kept coming back to class and putting our bodies through this workout. As a result, we have developed a common bond. I have valued these women and their friendship. They always give me a fresh perspective on family life, juggling schedules to include workouts, jobs, husbands, children and school schedules. We have exercised a bond of friendship, care and encouragement for another. When I didn’t show up because I was working at Starbucks, they came in to see me and buy coffee, asking when I was coming back. We often inquire about a person misses class. About two months ago, I invited the women to the monastery and to do a meditation/prayer class afterwards, called “Hard Bodies, Soft Souls.” They jumped at the idea and pursued making a time and date that we could all agree on. Not knowing how many women would show up, I was surprised that six women found their way to Saint Benedict’s Monastery for noon prayer, a tour of our sacred spaces, lunch and prayer and meditation time. They all seemed to enjoy the experience. When I got back to my office, a couple had e-mailed how much they enjoyed the day and asked if we could do it again. The next time we had class, the women asked when we were going to schedule the next one. One young woman told me that the day had a large impact on her. She made some major life decisions for healing, truth and abundance for herself and family. Another woman overheard us and asked if she could join us the next time. It reminds me of the quote from the book of Esther: “For such a time as this…” Community is best formed when it’s a movement of the Spirit, souls coming together to form the body of Christ. Let us be Christ for one another and bring each other to Christ. When I was much younger in religious life, I frequently read writings by Father Gerard Sloyan. One of his statements has stayed with me over the years: We must live in the “sacrament of the present moment.” That is such an interesting, rich phrase. I am one who likes to anticipate upcoming events and am often busy with planning future moves. Remembering Sloyan’s phrase has caused me occasionally to pause and reflect on how and why the “present moment” is a sacrament of sorts. Here in the monastery we live a schedule which dictates a pattern of actions in set times and manner—such as Liturgy of the Hours, Mass, meals, parties, dish charges, etc. One attends to these in a more or less dedicated way … but sometimes one doesn’t give complete attention to the at-hand task or pleasure. I find myself often anticipating when an event will be “over” and what I intend to do next, rather than giving full attention to what is immediately in front of me. Perhaps this is a common occurrence; still, I believe there is a sacredness, a grace that can be found in even the most mundane of activities. I woke up anxious. Why? Who knows! Drank my coffee, had lectio and was amazed at the healing of Jesus, but still I was anxious. I went to morning prayers thinking: I can get this anxiety out of my system. Instead, I was irritated by someone constantly coughing. Skip the centering prayer that would be impossible at this point. So I grabbed my snowshoes and headed out to the woods to snowshoe in the new snow. As I put on my winter gear, I almost talked myself out of it, thinking it was too cold and I didn’t have enough time. With a little self-talk and encouragement, I convinced myself I would benefit from the fresh air, solitude, silence and exercise. So I tromped out to the woods in the new-fallen snow, convincing myself this was worth it. 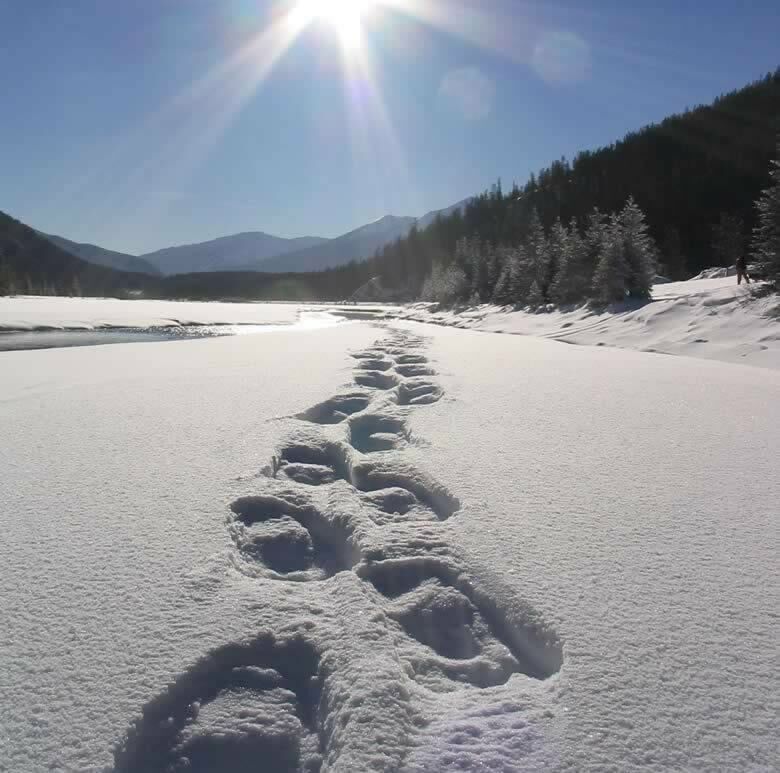 Soon my soul lifted as the snowshoes eased into the fresh powder. My tracks were fresh and I was alone except for the tracks of deer and rabbit. At last my soul started to find a groove, breathing in the beauty on the trail. On the trail, I was startled by a dead doe. It caught me by surprise and my heart was filled with shock and sadness. It startled any residue of anxiety right out of my soul and filled it wonder and care. Care for the creatures of our woods, for my life and breath, my friends and family. Consciously, I stopped and took some deep breaths to ground myself. I stopped and looked at the beauty of the snow fallen on the trail. I was amazed at the intricate designs of the snow, the color of the reflecting sun and chirping of birds that remind me that all life and breath is a gift. The center of God is all beauty. As I write this blog, I watch the sunset out my window, grateful for life. This year we have an 80-year jubilarian, which doesn't happen every year. If you figure that a woman usually enters religious life between the ages of 18-24, she would have to be at least 98 to make it to 80 years! Sister Suzanne will turn 99 on April 1, 2011. She still lives at Saint Benedict's Monastery, gets around very well and enjoys visiting with people. Many have benefited from a visit with Sister Suzanne. In fact, she still gets visitors from some of her earliest teaching days, back in the 1930s, in small towns like Sobieski, Browerville and Cold Spring, Minnesota. I sat down with Sister Suzanne on January 7 for a conversation about her ministries, her family live and religious life. Below are three video excerpts from our visit.